Imagine you discover that a house across from you was torn down and the lands sold to a developer whose plan is to build an 8 storey building. Well this has become the reality for a pocket of homes in Whitby. The property of 1201 Brock St South has been recently sold to a developer whose is proposing to put up an 8 storey apartment building housing 92 units as well as commercial stores at ground level. This would be like an elephant standing beside a cat. It will leave the area in darkness and cast a shadow on the street, leaving houses without sun. A group of neighbours are standing up for their right to sunshine. In a letter written to the Municipality of Durham, the members of this community not only fear they will be left in the dark, but they are concerned about traffic and the lack of resources available in downtown Whitby. They feel their community is bursting at the seams and coming short on everything a safe and healthy community needs. A community that does not have enough essential services to accommodate the already large community. Is Whitby going to lose "town" status? Is it becoming a city? How does everyone feel about that? As realtors, of course we love the idea of growing communities. The problem is there just isn't enough land to develop, to accommodate for the housing shortages. These mixed use buildings are the growing trend these days as cities require more density. The key word here is "city" not town! When people purchase homes/condos one of the major selling features is the amount of natural light a property gets. Studies have also shown that exposure to sunlight can boost serotonin, a chemical that controls our moods and that reduced sunlight can lead to decreased energy and sadness. 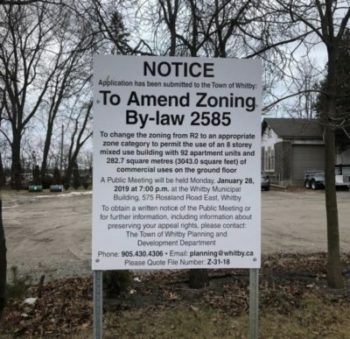 If the Town of Whitby has a goal to grow, then policies need to be put in place that protects homeowners comfort. There is a meeting on January 28th at 7pm at 575 Rossland Rd. E in Whitby for anyone wishing to voice their opinion on the situation. Of course sending an email to the town and your councillors is also welcomed. Thinking of all those that are potentially affected by this.